An MP has criticised a council for a "sarcastic" comment it made on social media about Bournemouth's roadworks. 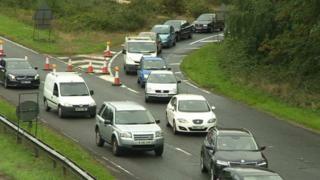 Delays of up to two hours have been reported since work began on the A338 Spur Road on Wednesday. In response to a claim that workmen were drinking tea instead of working, the borough council said: "Workmen also still entitled to a teabreak last time we checked employment law." MP Conor Burns described the tweet as "utterly and completely unacceptable". A petition to "fix the broken A338 roadworks plan", which is part of a £20m scheme, has been signed by more than 450 people. Regarding Bournemouth Borough Council's comment, Mr Burns, MP for Bournemouth West, tweeted: "This sort of sarcastic comment is utterly and completely unacceptable from an organisation that is entirely funded by the taxpayer. Taxpayers also pay the salary of whoever wrote that." The Conservative politician also told the Bournemouth Echo: "I don't think it is appropriate for an organisation which draws almost every penny of its funding from the taxpayer to be making really rather sarcastic, passive aggressive comments to those concerned about the delay and economic cost of these roadworks." Twitter user Daniel McGuire also criticised the authority's comment: "People are rightly annoyed! No need for your sarcasm!" While Matt Read described it as "embarrassing". The council said it had given plenty of warning about the roadworks. It has not yet commented on the tweet following a request by the BBC. On Friday afternoon, Bournemouth East MP Tobias Ellwood tweeted: "Just gone 4pm and not a worker in sight... Puzzled why miles of road already upgraded needs to be coned off? #welcometoBournemouthpleasedriveslowly"
Other motorists have questioned why the works cannot be carried out at night. The authority said: "Unfortunately not all work activity in this scheme can be undertaken at night but where possible tasks will be done at all hours." The works are expected to take nine months to complete.